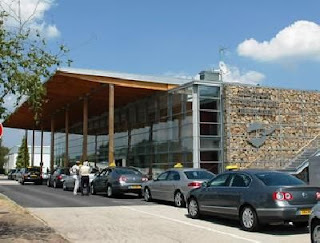 Avignon Airport is a small, compact and easy to use airport with many similarities to London City Airport. It is a short 20 minute, six mile drive from the centre of Avignon. New flights from London to Avignon airport start in May. More to follow. Not sure if I've successfully linked this blog with our twitter account. Will see if this post appears. France Airport Guide is now on twitter so you can follow all our updates easily including any French airport updates, flight/route news, important weather announcements and much more. Ryanair pulls staff and planes out of Marseille airport in row over contracts. 2010 has seen more than 340.000 passengers travelling to/from Limoges international airport; flights to England have enjoyed a great success while charter fights as well as business flights have increased their activity by nearly 20%. With low fares beginning at just 59€ for a one-way trip (inclusive of taxes), the flight to Paris-Orly, now operated by Airlinair, has created its own slot in the market. 2010 was also a year where renovation work was undertaken in the bar/newsagents area; Now there is a shop for both newspapers and cigarettes which is separated from the bar by a counter where one can purchase various kinds of sandwiches and snacks. During the first 3 months of 2011 redevelopment work will begin in the bar itself, in order to make it more spacious and more comfortable for our customers. Beginning Spring 2011, the historical routes to London, Liverpool, East Midlands and Southampton will be maintained; the route to Leeds will also operate from April to October and the one to Newcastle will operate every Saturday, from May to September. For the coming year, Limoges International airport will also carry on working to improve its Quality, Security, Safety and Environmental certifications, with the aim of retaining its clients’ confidence. Passenger numbers at Beziers airport broke new records last year and further development this year will herald continuing growth. 130,374 passengers used Beziers Cap d’Agde airport last year. This level is the third year running of strong growth (+49% in 2010). Daniel Galy, Chairman of the Airport said: "The platform is now clearly positioned as a regional operator in its own right, installed on a niche market" low cost "carrier for traffic and for economic activity our territory." Development will continue in 2011 with the opening of a fifth link Oslo with Ryanair and the arrival of a new 2nd and Flybe launch that first line from / to Southampton next May. 2011 traffic forecast is around 160 000 passengers. Many thanks to Robin Hicks at WOW for this info. Lucy Hollister from the AA has just emailed with some new info regarding flights from the UK to Lyon. Lucy says,............."For info Low cost flights (Easyjet) now depart from Terminal 3 at Lyon Airport." Many thanks Lucy for this helpful info.